Adoption is how you came to be a family- not a parenting style. Be the parent you are meant to be- the parent your child needs you to be, today. Adoptee, author, speaker, blogger and mommy, Madeleine Melcher is a breath of fresh air in a climate of negativity. Melcher’s piece, What an Adoptee Wants You to Know About Adoption, garnered over 87-thousand likes on The Huffington Post for just that reason. Melcher is honest and full of candor, regarding the realities of adoption and what that means to your parenting. 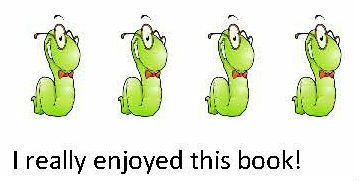 You may be surprised at what you read! Her message has been described by parents who have adopted as, "life-giving"! 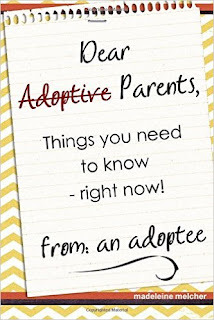 Written as a series of letter to parents who have adopted Madeleine Melcher offers positive encouragement and advice. There are several important take-aways I received from this book. 1. Don’t live your child’s adoption. It does not have to be the most important thing in the room. They are a child, you are their parent. I’m not saying ignore that they came to your family through adoption but by living and breathing adoption is not allowing the child to live and grow as anything else but adopted. 2. Your tone regarding adoption sets the tone that they will carry with them about adoption, how they will view it how they perceive it. If you have complaints or negative things to say about adoption they will know and they will internalize it. 3. Listen to your child. You are the parent of a very special person that has a very special bond with you. Make sure you are listening to them and their needs and not just what you perceive their needs to be. 4 Listen to yourself. Don’t focus on how that child came to be in your life remember that you are their mother and/or father. How they became yours doesn’t matter when you are sitting by their bedside while they are sick or taking them to their first day of school. Its all the little moments that add up to you being there for them and doing what is in their best interest. 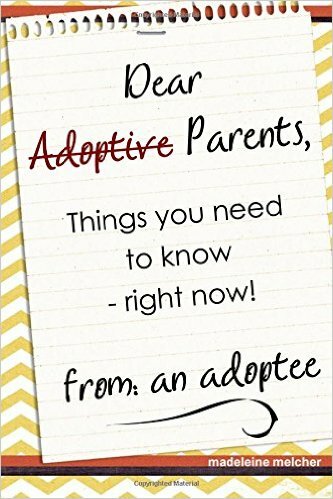 Very positive book that is empowering to parents who have formed their families through adoption.